Anyway – IDE helps a lot in setting up a complex development environment (in Java or others) – so it may help you in increasing your productivity (although I’m not sure about this, I feel more productive on a simple text editor like gedit or very powerful text editors like Vim or Emacs, I don’t use Java either). Although, I’ve written this post primarily for Ubuntu 12.04 LTS (precise pangolin) users but it should work well in other versions of Ubuntu as well as on other similar distributions – specially Debian based distributions e.g Linux Mint, Kubuntu etc. Now, you’re installed the core platform you can install development plugins according to your need. I’ve listed some of them so if you can’t find the plugin for your preferred languages here, then go to official site. If you want to setup Eclipse with Java then install Java Development Tools (JDT) package for Eclipse. Now, few more Next Next .. and you’re done! I’ve already explained in detail(step by step instruction) about setting up Android SDK on Ubuntu – so refer that post if necessary. Ubuntu – The most popular Linux distribution for desktop users (with an exponential growth in past few years) and Android – one of the most popular mobile operating system, also based on Linux kernel; developed by Google Inc.
Ubuntu 11.04 (alias : Natty Narwhal) or older versions such as 10.10 (Maverick Meerkat) or 10.04 (Lucid Lynx) is now becoming the dominant choice for programmers and web developers probably due to the features (cool desktops (window manager, e.g Gnome, KDE..), open source applications, tools, no licensing cost…) and flexibility available on Linux based operating systems. Android stable version 2.3.5 (Gingerbread) was released a day ago. 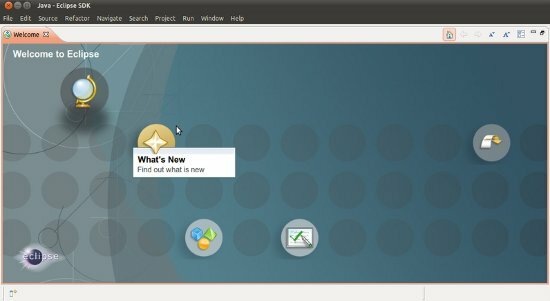 Do you want to develop android apps using Linux based distributions, then this post will explain you about installing Android SDK (Software Development Kit) on Ubuntu, despite of that you can apply the same procedure in installing android sdk on other Debian based GNU/Linux OS such as Linux Mint. After installing those packages, come back here to proceed. 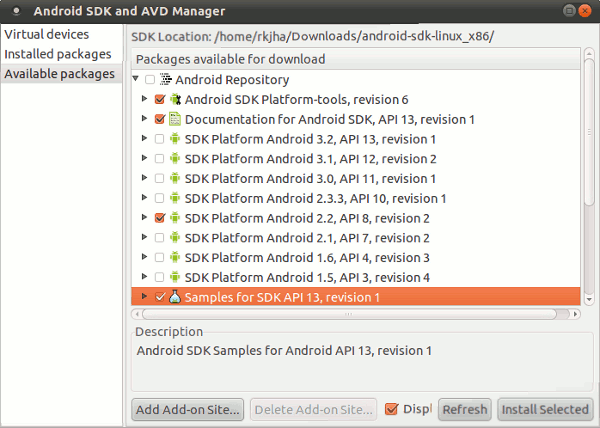 step #1 : Download and install the android package(s). Open Terminal (CTRL+ALT+T) and move on (use cd target_directory) to the directory where you have downloaded the packages. start Eclipse and go to Help > Install New Software, then click on Add. 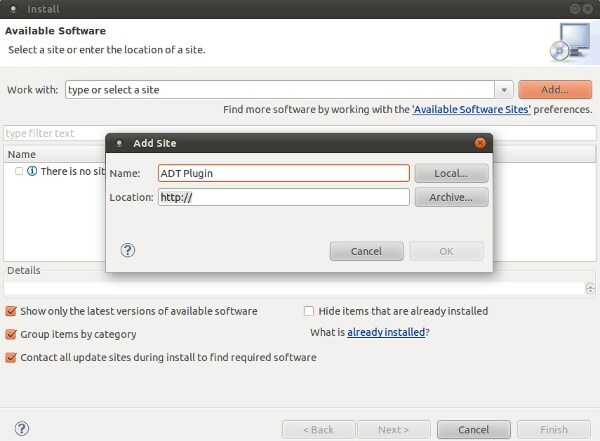 Enter the ADT Plugin in name and the following address (in case of any problem, try http instead of https (The secure version of http protocol).. or simply click on archive and locate the manually downloaded ADT plugin file ) as Location. Then click on Next -> select developers Tools -> Next -> Finish. Now, it’s time to configure ADT Plugin, Click on Window -> Preferences -> Select Android in left panel and locate the Android SDK directory, and hit Apply/OK. Nowadays, IDE i.e Integrated Development Environment is used by most of the Programmers and software developers, as it provides sophisticated software development environment; features like – auto code completion, easy testing and debugging, syntax coloring, framework integration etc. So IDE creates a layer of abstraction, that is certainly helpful for production environment, but may not be good for novice programmers (due to abstraction layer created by IDE, they might lack some background concepts). There are a number of IDEs available in the Market, but few open source IDE like Eclipse and NetBeans are the most popular. 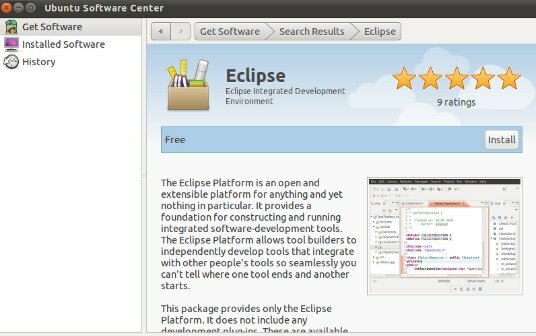 Eclipse IDE is a multi-language software development environment, written in java and available for all platforms like Linux based OS, e.g Ubuntu 11.04 (Natty Narwhal), Debian, Linux Mint, etc, Windows and Mac OS X. Eclipse is a free and open source software (Available under Eclipse Public License, very close to GPL), developed by FOSS community. Eclipse is the most popular IDE among the Java developers. Eclipse architecture is very flexible and modular, so eclipse is well suited not only for Java programming (with JDT (Java Development Tools) ), but also for C/C++, with CDT (C/C++ Development Tools) components. 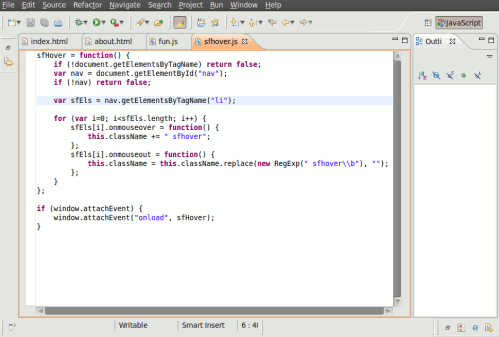 Most of the frameworks and environments are well suitable with Eclipse; functionality can be easily added with plugins. 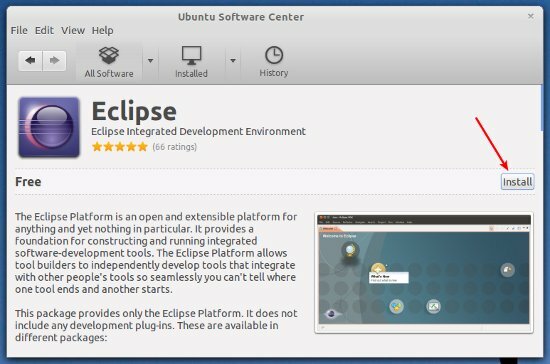 On Ubuntu 11.04, you can use synaptic package manager or Ubuntu software center or shell to install eclipse in few clicks. #1 : Go to main menu (Top Left Corner) and search for ‘ubuntu software center’ or just open it from left econ bar. #2 : Now, search for ‘eclipse’ in quick search bar. #3 : Click on more info (if you want to know more(like Ratings, reviews) before installing, generally recommended), then click on install to begin (You may have to enter your login password), wait until the installation is complete. #4 : That’s all..you can access it from the main menu (just type ‘eclipse’). Get eclipse from its official website and extract it to any directory (say ‘home’) and make it executable using chmod command, add a path variable (to access directly) if required. This post will explain about some open source and free web development tools that you can use to increase your productivity while using Ubuntu(Linux Based operating system,specifically designed for desktop users) 10.10(Maverick Meerkat) or 10.04(Lucid Lynx).